Feast on this Special Offer for Xmas! You'll probably already know that the team at Concept Vehicle Leasing like to do things a little differently. It's the Concept way. It's not about Black Friday or Blue Monday for us. It's all about the big day – Christmas Day. This year, we want to help you celebrate in style!Nope. We're not going to send you a Christmas jumper. Such an important decision on personal can only be made by you! 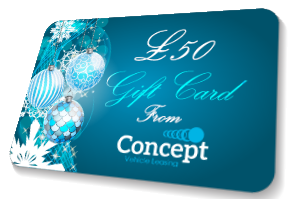 But – we will send you a lovely £50 voucher to spend in M&S or Tesco if you take delivery of a new car or van on lease with Concept Vehicle Leasing by 24th December! So, Christmas Dinner's on us this year.... that's the spirit! Santa is already busy preparing for the big day though – there isn't a huge amount of time to take advantage of this fabulous offer. Get in touch with the team at Concept Vehicle Leasing to secure your new car or van for delivery before Christmas before it's too late! 1. This offer is based on orders which are placed with Concept Vehicle Leasing from 15th November 2018, with delivery by 24th December 2018 only. 2. £50 voucher will be issued on the date of delivery and is restricted to Tesco or M&S stores only. Voucher will be issued to a validated e-mail address only. 4. We reserve the right to amend or withdraw this offer at any time and without notice. 5. This offer is based on deliveries by 24th December 2018 only, and we cannot accept responsibility for manufacturer / supplier delays which are beyond our control.